Hezbollah, Baalbek, Lebanon. Photo: yeowatzup/flickr. Hezbollah’s narrative is shifting now that it has entered into Syria’s civil war and taken the side of one Arab party against another, said Thanassis Cambanis, author of A Privilege to Die: Inside Hezbollah’s Legions and Their Endless War Against Israel. “Here is the Lebanese Party of God, whose raison d’être is to fight Israel, suddenly turning its firepower on a group of Islamist Sunni Arabs,” he said. Last week saw a worrying example of the sectarian tensions worsening in Lebanon, when 40 people were killed in clashes between the Lebanese army—apparently aided by Hezbollah—and Sunni militants in Sidon. 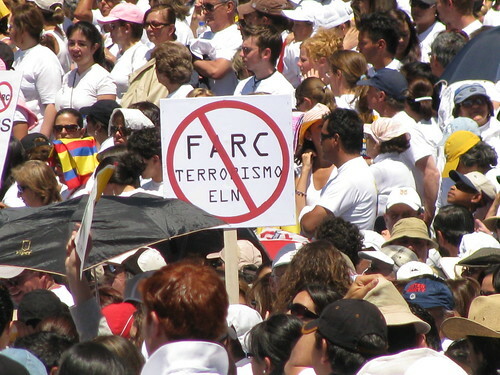 Anti-FARC demonstration in Bogotá, Colombia, 2008. Photo: Patton/flickr. 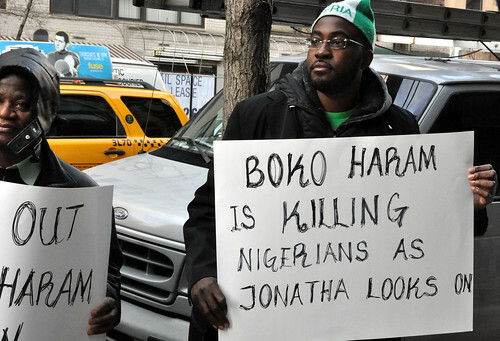 Protestors against Boko Haram and the Nigerian government’s policies to fight the group. Photo: Michael Fleshman/flickr. More than 700 Nigerians have died so far this year in over 80 attacks associated with Boko Haram, the Nigerian terrorist group that a recent United States report ranked as the second most deadly in the world after the Taliban in Afghanistan. Most of the deaths occurred in March and April (208 and 335 respectively), confirming the alarming dimension of Boko Haram’s atrocities in Nigeria.